THE SPOOKY SPACESHIP - an easy, free SF book for younger children, the third story about Belinda and her alien friends. I stared at the screen of our star-ship. It was black and empty. There were no suns or planets: nothing but faint, distant stars. "Where are we going, oh brave and beloved Captain?" I asked. My father the Captain was steering with one of his tentacles. "We're taking Belinda back to her own planet," he said. "This is the shortest way." "What? Home? No!" yelled Belinda. "I don't want to go home yet!" "No!" echoed my little sister Roa. "I don't want her to go either!" Even I had to admit that although Belinda was a very annoying alien, life on our star-ship had been a lot more interesting since she arrived. I'd got used to her lack of purple fur, and those odd sticks she called arms and legs. I'd got used to her funny-looking face, with its two eyes, and only one mouth. But what a mouth! I'd never got used to her shouting. Now she began to yell more loudly than ever. "I'm not going home! We're supposed to be on holiday!" My dear father winced and covered his four ears. "We are on holiday, dear delightful Belinda," he replied. "We've seen the Marvellous Moons of Merzi, and we'll see more sights on our way home." "What sights? There's nothing here!" "A bit further on, there's the Duck-head Nebula." I couldn't stand it any more. "All right then. We'll take you straight back home and dump you there. And good riddance!" I declared. My beloved mother stared at me in surprise. "Cherished child!" she gasped. "How could you be so rude?" Me? Why was I the one to be told off, instead of her? But Belinda began to howl. "I know you want to get rid of me! But I don't want to go home. I don't want to go back to school!" To my horror, her eyes began to leak. Water dripped down her face. This had happened once before. I didn't know what to do. My sister Roa grasped Belinda's thin pink wigglies and gently stroked the weird yellow ropes on her head. "Why not, Belinda?" she asked. "What's wrong with your school?" "I'm always getting into trouble!" sobbed Belinda. "They might as well glue me to the naughty chair!" I wondered what she meant. How could a chair be naughty? But before I could ask her, a siren began to wail. A red light started to flash. "A distress signal!" gasped my gallant father. He stared at the empty screen, looking puzzled. "But where's it coming from?" "There must be someone out there after all," I said. "And they need our help!" "Let me see if I can track them down," said my wise mother. Her nimble tentacles flicked over the controls. "Aha! I've found a spaceship," she said. "Let me zoom in on it." A cargo ship appeared, turning slowly on the screen. It was completely dark. We could only see its outline against the distant stars. My beloved mother began to talk to the intercom. "Hallo? Hallo? Is anybody there? Have you got a problem with your ship?" She looked worried. "Nobody's replying." "But somebody must have sent the distress signal," Roa said. "Maybe they've all been eaten by a dreadful space monster!" cried Belinda eagerly. "I hope not, dear child," said my father with a shudder. "We had enough of that sort of thing at the Moons of Merzi." "I wonder what's wrong?" said my kindly mother. "I'd better go on board and find out," said my fearless father. "Prepare the shuttle for launch!" "Wait! I'm coming with you!" yelled Belinda. "And me!" I cried. "You might need back-up." "It could be dangerous," warned my mother. "That ship looks abandoned. I expect the crew have already left in the escape pods," said my father. "You stay here, oh worthy wife, and look out for them. The dear children can come with me." "Very well - but you must all leave that ship at any sign of trouble!" my prudent mother told us. "We will. Let's get our equipment," my father said. He got our spacesuits. Roa brought the helmets. I picked up a translator. And Belinda grabbed a huge piece of slimed sludge cake. Then she jumped into the shuttle behind me, looking happy and excited. "I hope it's a band of space pirates!" she said. "There are no pirate ships in sight, esteemed Belinda," my father pointed out. "Then maybe a terrible plague has attacked the whole crew!" she said gleefully. "And when we get there, we'll find nothing but skeletons!" "But they've only just sent the signal," I protested. "So?" said Belinda. She seemed to like trouble. No wonder she was always getting into it at school. At last our shuttle reached the cargo ship, which was still slowly spinning. The skilful Captain had to spin our shuttle too, while we linked up to the docking bay. "Wait here," he said. He put on his spacesuit and went into the airlock. A moment later he returned. "We won't need spacesuits after all," he told us. "The air on this ship is safe to breathe." "But what about the plague?" cried Belinda. "There are no dangerous germs here, dear delightful Belinda, so don't worry about that." "Bother," she muttered as she followed me out of the shuttle. Although the spaceship was dark, it didn't take long for our clever Captain to find a control panel. He switched on the lights. Then he stared at the control panel with surprise. "All the escape pods are still here!" he said. "The crew must be on board. Let's go and find them." We began to walk down a long, shiny silver corridor that curved round the ship. It had lots of little doors. When we opened them, we saw neat cabins with small bunks. But there was nobody walking in the corridor. There was nobody lying on the bunks. There was nobody sitting in the cabins. The ship was totally silent. "Hmm," said my valiant father. "This is very strange." He led us to the Captain's deck at the front of the ship. There was nobody there either. "The ship's been left on autopilot," said my father. He switched on the radio and spoke to my beloved mother. "Everything is quiet here," he told her. "The place seems to be deserted. I don't understand what's happened, but we'll keep looking around." "Be careful!" said my loving mother. Belinda grinned at me. "Spooky!" she whispered. "Spooky? What does spooky mean?" I asked. "It means there might be ghosts!" she said. "Maybe this space-ship has a ghostly crew! It's haunted!" She opened her eyes wide and waggled her ten pink wigglies at me. Then she made a horrible hooting noise. "Wooo-ooh! "You don't frighten me," I told Belinda. "I don't believe in ghosts." "Well, who else could have sent a distress signal from an empty spaceship?" "We haven't explored the whole ship yet," I pointed out. My wise and wonderful father overheard me. "We'll explore it faster if we split up. I'll go this way - you three go that way. Stick together!" So the three of us set off down another curved silver corridor. I peered through every door we passed. They just led to cabins and store-rooms, all the normal things. But there was no sign of life anywhere. Everything was still and silent. Everything except Belinda. She kept waving her wigglies at me and hooting. "Wooo-ooh! Oh, I'm a ghastly gruesome ghost!" "Stop it," I said. But she wouldn't stop. I did my best to ignore her. That didn't work either. "Wooo-ooh!" she wailed. To get away from her, I dived through the next door that we passed. This room was a kitchen. Fruit lay on a counter. There was bread on the table. Belinda followed me in. "Boring," she said. "No cake. Come on, Roa, let's go." To my relief, they went out again. I stayed behind to look around. Reaching out a tentacle, I felt the bread. It was fresh, not dry and stale. So was the fruit. The food on the table looked half-eaten - as if somebody had jumped up and left in the middle of a meal. So where were they? I hunted around the kitchen for clues without finding anything. When I came out, I looked for Roa and Belinda. I couldn't see them anywhere! Then I heard Belinda wail. "Wooo-ooh!" "Wait for me!" I cried, hurrying after the sound. But when I got round the bend of the corridor, there were more silver corridors leading in all directions. Because they were curved, I couldn't see very far down any of them. "Roa! Belinda!" I called. There was no answer - only echoes. I stood there feeling very cross. Now I didn't just have the missing crew to search for. I had my little sister, and that stupid alien! So I set off down the nearest corridor. The empty spaceship really did feel a bit spooky. I wished Belinda hadn't put the idea of ghosts into my head. Although I moved as quietly as I could, my tentacle-steps sounded loud in the silence. Then I saw something that scared me a whole lot more. I froze in alarm and held my breath. Ahead of me, fruit was floating through the air! I couldn't believe my eye. Both my mouths fell open in astonishment. An apple and a banana were sailing down the corridor. But nobody was carrying them! My heat began to pound. Could the spaceship possibly be haunted... by fruit? I swallowed, and told myself, "There's probably something wrong with the gravity field. Yes! That's the answer!" But that only made me feel better for a few seconds - because then the apple disappeared. It just blinked out of sight! Broken gravity fields could make things float, but they couldn't make things disappear! All my fur was quivering. I wanted to run away. Firmly I told myself that a ghostly banana couldn't hurt me... could it? And I suddenly walked splat into something very big that I couldn't see. When I say splat, I mean splat. I felt as if I'd just bounced off a giant jelly. Cautiously I poked out a tentacle. It met something soft and squidgy. "What? Who's there?" I yelped, leaping backwards. "Are you a ghost?" "Why did you just hit me in the tummy?" "I couldn't see you!" I said. "See? What do you mean, see?" "I mean, when I looked for you with my eye!" I said, wondering if the translator wasn't working properly. "Eye?" said the invisible squidgy thing. "I've heard of eyes, but I don't have any." "Don't you? Who are you?" "I'm a Niffity," it said. This wasn't very helpful. I gently reached out my tentacles to touch the invisible Niffity. This time I tried not to poke it in the stomach - wherever its stomach was. The Niffity felt warm, and round, and as soft as a marshmallow; but it kept changing shape. It would grow little wigglies a bit like Belinda's, and then they would shrink again. "You're not a ghost, then," I remarked. "Of course not!" said the Niffity indignantly. "Is this your ship?" I asked. "No. I'm a stowaway," said the Niffity. "I'm trying to go to the Duck-Head Nebula, and I couldn't afford the fare. So I hid on this ship at the space-port." "What were you doing with that fruit?" "Oh... I was hungry." The Niffity sounded a little ashamed. "I went sniffing around the ship for food. I'm sorry about stealing the fruit, but when I smelt it I just couldn't resist. That apple was delicious." "So where are the ship's crew?" I asked. "Have you seen them?" "I did hear people on the spaceship at first," the Niffity said, "so I've been trying to keep out of their way. Then this morning, when I was hunting for food, I heard screaming. After a few minutes it all went quiet, and I haven't heard anybody since." "You don't know why they sent a distress signal?" "I wonder what can have happened!" Maybe Belinda was right, I thought. Maybe space pirates had attacked the ship, and kidnapped the crew! Of course they wouldn't have seen the Niffity - and it wouldn't have seen them. "Oh dear," said the Niffity. "I hope they're safe. I suppose I'll never get to the Duck-Head Nebula now!" "My dear father the Captain might give you a lift," I said. "Really?" asked the Niffity hopefully. "I should think so. But in return, I'd like you to do something for me!" I'd just had a brilliant idea. When I told the Niffity what I wanted it to do, it didn't seem to mind. In fact, it giggled! "When do I start?" it asked. "Right now," I said. "Let's go and find Belinda!" I looked around. "Now, I wonder where she is..."
"I can hear voices," said the Niffity. "They're down that way!" The Niffity must have had very sharp ears, because I couldn't hear anything. I held its soft wigglies with a tentacle, so that I wouldn't lose it as it set off. It led me down a long, curved corridor - and there, sure enough, were Belinda and Roa. "Hey!" I called out. "Wait for me!" Belinda turned round and began to laugh. "Slowcoach! Couldn't you keep up? You need proper legs!" "I've been hunting for you all over the ship!" I protested. "Our noble father told us to stay together!" "Aah! Poor little purple fluffikins. Were you scared all on your own?" taunted Belinda. "Did you think a big bad ghost would come and get you?" And she waved her arms at me and hooted. "Wooo-"
But this time she stopped in mid-hoot. Her eyes widened. She gasped - and so did Roa. They were both staring at something behind me. I knew what they were looking at. But I pretended that I didn't. "It's a - it's a banana," gasped Belinda, "floating in the air!" "Don't be ridiculous," I said. "You're just trying to scare me again! Well, it won't work!" "Look behind you!" she shrieked. "A flying banana! It must be a ghost!" I turned round slowly. By the time I was facing the banana, it lay on the floor. Turning back to Belinda, I told her, "Don't be silly. You're making it up!" "I'm not! It's there again!" "It really is!" squeaked Roa. "Oh, help!" shouted Belinda. "A haunted banana! - and it's coming towards us!" "Rubbish," I said. I was enjoying myself. But Belinda screamed, "I'm off!" She fled, with Roa following her. I ran after them both. And the invisible Niffity ran after me, still holding its banana. Every time Belinda turned round and saw the banana flying through the air towards her, she shrieked and ran off again. But then the corridor finished in a dead end. There was nowhere for her to go. The only way out was a door labelled Spacesuits. Belinda flung it open and jumped inside. She slammed the door behind her without even waiting for Roa. Roa stopped outside, looking terrified. All her fur was shivering. "Don't worry, oh sensitive sister!" I whispered. "The spaceship isn't really haunted by flying fruit. It's just a-"
But before I could say "Niffity", the door burst open, and Belinda shot back out. "No, no, there are no ghosts," I told her. "There are!" Her voice had gone all high and wobbly. Her arm was shaking as she pointed at the door. "There, in that room! It's haunted! It's full of ghosts!" "More spooky flying bananas?" Roa cried. "No. That horrible room is full of haunted spacesuits!" wailed Belinda. "Ghostly spacesuits - with no heads!" "I don't believe you," I said, but my fur began to quiver and quake just like Roa's. Slowly I reached out a trembling tentacle and nudged open the door. The room was full of spacesuits. But they weren't hanging up limply on hooks. They were facing me. Not just that - they were moving! They were walking towards us! And Belinda was quite right - they had no heads. Every spacesuit ended at the neck. The crowd of headless suits advanced. They marched out of the storeroom, while we shrank back. "I told you! Ghosts!" Belinda yelled. Then, like an eerie echo, a dozen voices whispered: "Ghosts..."
The three of us turned to run. I'd forgotten that the Niffity was behind us. I ran splat right into its soft, invisible, marshmallow tummy. Roa ran into me. Belinda ran into Roa. 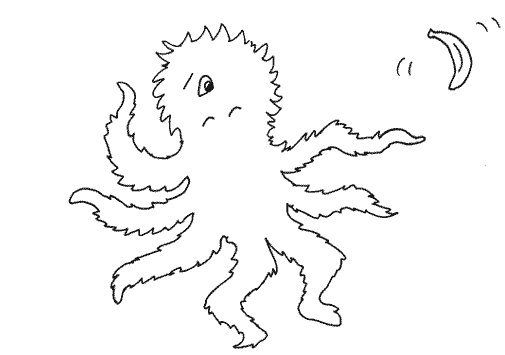 We tumbled down in a tangled heap of legs and tentacles. Managing to untie myself, I sat up and stared in horror at the headless spacesuits. They were still coming towards us! And then the nearest one began to speak. "We've got you now, ghosts!" it said, in a hollow, echoing voice. "We're not scared of you!" "Hang on! We're not ghosts," cried Roa. "You're the ghosts!" "Us? We're not ghosts!" said the headless spacesuit. "You're the ghosts!" All at once the spacesuit began to writhe and wriggle in a terrifying way. Belinda squealed in horror. Then there was a loud pop. A head appeared out of the spacesuit's neck opening. It was a thin green head, a little like a lizard's, with three small orange eyes. Pop! Pop! Pop! Out of the other headless spacesuits emerged more green heads. These green lizard-people did not look very ghostly. But they did look very scared. "Where are the ghosts?" cried the first one. "They were here only this morning! We were so terrified that we radioed for help, and then we ran to hide!" "So you sent that distress signal?" said Roa. "We heard the signal," I explained, "and we came to rescue you. What did these ghosts look like?" The lizard-people glanced at each other. "Well," said the first one, "we didn't actually see them." "But we saw them eating our food!" said the second. "They attacked our kitchen and tried to steal our breakfast!" "They snatched the bread right out of our hands! We saw it float across the room!" "Ah," I said. "I think I can explain. Or maybe the Niffity can explain itself. Niffity?" "What are you talking about?" said Belinda. "Niffity!" I called. "Where are you?" But the Niffity had gone. Instead, I saw my beloved father hurrying down the corridor towards us. He was glad to find us safe. At once the little green lizard-people all began to tell him how they had seen (or rather had not seen) terrifying ghosts in their kitchen, and had been so scared that they had run away and hidden in the spacesuits. Then I told him about the Niffity. "A Niffity? I've never heard of a Niffity, dear child," he said. "Neither have I," said Roa. "Neither have I," declared Belinda. "And that's because there's no such thing! You've just been playing tricks on us!" "No, I haven't!" I protested. "Hush, beloved children," said my all-knowing father. "The important thing is that nobody is hurt. And there is certainly nothing harmful on this spaceship now. I've checked it all." "Then what about the food that floated through our kitchen?" asked the lizard-person. "A problem with your gravity field?" suggested my wise father. "Oh! We never thought of that." The lizard-people shuffled their feet and looked embarrassed. "We're sorry to have brought you all this way for nothing." "We're always glad to help," said my ever-generous father. "Now, charming children, let's go back to the shuttle!" We bowed politely to the lizard-crew, and they bowed back. 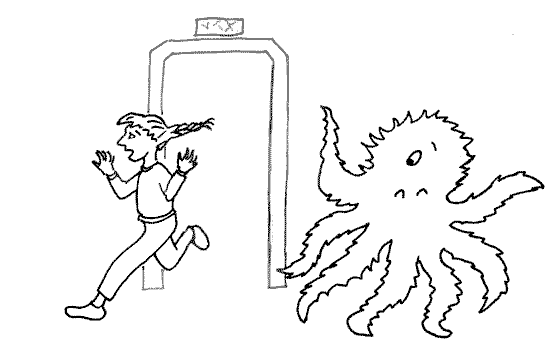 As we set off to the shuttle, I kept reaching out my tentacles to check if the Niffity was anywhere around. But I couldn't feel it. I was rather sad, because I had liked the Niffity. It seemed a shame not to even say goodbye. All too soon we were on the shuttle and heading back to our own ship. It wasn't long before Belinda began to grumble. "There weren't any horrible plagues or space pirates after all!" she complained. "There wasn't even a ghost! I wish there had been." "You were terrified when you thought there was a ghost," I reminded her. "No, I wasn't," said Belinda airily. "I was just pretending." She looked around the shuttle with a frown. "Where did my slimed sludge cake go? I'm sure I had some left." I was about to tell her that she must have eaten it, when I felt something touch my fur. It was a warm, soft, marshmallowy sort of touch. I said nothing. But when our shuttle docked, I made sure I was the last one out. I carefully left the door open for a minute, until I felt something soft and squidgy squeeze past me into our star-ship. "Now we'll go to see the Duck-head Nebula on our way to Earth," my dear father promised us. "Oh, bad," grumbled Belinda. "I don't want to go back to boring old Earth. I want to stay and have adventures." "You've just had an adventure," I said. "But we never saw a ghost after all on that spooky spaceship," she complained. "I wish this was a spooky spaceship!" "Yes! I do wish it was haunted!" sighed Belinda. "That would be so exciting!" "All right," I said. "Oh perfect and polite Belinda, maybe I can make your dreams come true." Belinda snorted. But Roa asked, "What do you mean?" I winked at her. "Just wait till dinnertime..."